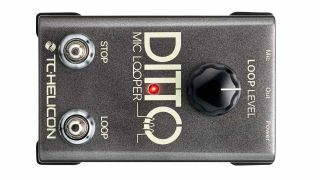 TC-Helicon reckon they've made looping simpler with the Ditto Mic Looper. The simple box features only Loop and Stop buttons, plus a Loop Level knob, but the company reckons it's what's inside that counts. So what is inside? 24-bit sound with a "great-sounding" pre-amp, phantom power, and an auto-input-gain control, meaning that you won't have to calibrate your levels. Extra functionality is provided by using the two buttons in different ways. Erasing a loop can be done with the normal Stop button, and Undo/Redo functionality is on-board as well. As for the loop length, you're looking at as much as a five-minute total. On top of that, the Ditto Mic Looper can be controlled by TC-Helicon's new MP-75 Mic, and can connect to a computer via USB to receive firmware updates when required. It's coming in February this year, at £129/€149/$149. Find out and see more at the TC-Helicon website.